we will help in ending the overpopulation of homeless pets. Your Car Tells the World How You Feel About Animals! 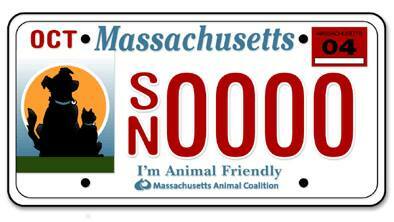 The Massachusetts "I'm Animal Friendly" license plate tells your community that you care about animals! By purchasing this license plate, you will be contributing to a statewide program that directly benefits Massachusetts animals. The proceeds are used to spay/neuter animals that are either feral or that their owners cannot afford it. We help local shelters provide medical care for sick or injured animals to help them get adopted instead of being euthanized. We subsidize the adoption fee for a senior person (55 years or older) to adopt a senior animal (5 years or older) from a local participating shelter. With your support, this program can help senior people and shelter animals find the perfect, needed match! Email to find out what local shelters are part of this great program! We we subsidize the adoption fee for a local veteran who has served in a war and is under a doctor’s care to adopt an animal from a local participating shelter. Studies show that veterans who experience post-traumatic stress syndrome have lower blood pressure and lower suicide attempts when they own a pet. With your support, this program can help veterans and shelter animals find the perfect, needed match! We are collecting Cat and Dog food donations to help the low income Elderly citizens of our community who need help feeding their beloved pets. Primary need for CAT food but dog food is welcome too! Research from social and medical sciences confirms that companion animals can and do improve health and overall happiness. Studies show that older people who own pets are more healthy and active than those who don't. Pet owners are less likely to suffer anxiety, loneliness and have more confidence than people without pets. Pets have a positive effect on your emotional health, and people who live alone with a pet are less likely to be depressed than those who live alone without a pet. Thank you for participating in this program and helping us to help the elderly citizens of our community and their pets too! Download our brochure with more info! A free workshop offered to help expecting parents to educate them how to introduce their pet to the new baby.contact us by e-mail. So we will be ready to help the community when a disaster strikes! to become a credentialed volunteer ready to help with a local Disaster Animal Response Team in our community. The Coalition for Animals, Animal Control and Emergency Management of New Bedford are building a South Coast DART and are working with SMART (State of Massachusetts Animal Response Team) to volunteer at a local or any Massachusetts disaster animal sheltering site. ﻿Supplying our local fire departments and Emergency Medical Service Departments with oxygen masks to fit your dogs and cats in case of a fire. Establishing a immediate reward to lead to the capture and conviction of any local animal abuser. Helping to support local licensed wildlife rehabilitators with medical funding for injured wildlife. Saying Goodbye to a beloved pet is a painful and emotional experience for every member of the family. The Coalition for Animals can help during this difficult time by offering a low cost Cremation Service. The Final Gift is a way to give your loved and loyal pet one last gift. Cremation Services include an urn for your pet’s ashes. Please call New Bedford Animal Control at 508-991-6366 and Leave a Message. offspring of cherished family pets. Spay/neuter is a proven way to reduce pet overpopulation, ensuring that every pet has a family to love them (HSUS). Help promote adoption of shelter animals by becoming a foster parent. Many animals do not do well in a shelter environment and would benefit from a transitional home before being adopted into their forever home. Medical and food expenses are typically paid for by the shelter. All you need to provide is a temporary loving home!